Tedium and Other Sensations, as featured in the Chicago International Puppet Theater Festival, is the product of a massive collaboration. Mocrep, The Neo-Futurists, and Theater Oobleck converge to explore and adapt the written work of Chicago playwright, Mickle Maher. The result, a two-part event that left me questioning everything I know about time, food, and theatre. Mocrep, an interdisciplinary experimental artist collective, energizes the palette with a newly developed piece co-created, directed, and performed by the cast of six. In the theatre lobby, folding chairs are arranged like pews, facing a buffet of American staples. Most notably, a gallon of milk, an iced-cake, and a large roast turkey. Above hangs a television showing static. Not a flat-screen, sports-bar tv, but a rolled-into-class cubed television. The whole atmosphere is reminiscent of a David Lynch film. Other Sensations is a full body sensory overload. This multi-media performance plays with instruments, food, language, and bodies. The six performers repeat the words “freedom” and “choice” and “America” each infused with a different meaning. One moment of repetition went on for so long with such little change that I’m not sure how much time passed. The tv then plays a painfully 90s commercial that ties everything together. All that distortion and repetition from earlier is finally given context. My eureka moment is short lived and I’m given exactly 300 seconds to move on to the main event. The countdown directs me to Tedium in the theatre. First performed by Mickle Maher in 2001, this 2019 adaptation is the work of Neo-Futurists ensemble member Dan Kerr-Hobert. Dan Kerr-Hobert is a lovable lecturer who recounts the story of this initially terrible play that became a must-see event. He literally sets the stage by unboxing the characters, the first is a little grey figurine of Greg the playwright. Kerr-Hobert finalizes his stage and explanation of the past production’s horrors. Then, theatre seating on Dan Kerr-Hobert’s little platform is flipped around to present the image of an amazed audience. He informs us that this production is Greg’s most successful work. Two moments of Greg’s play allegedly produced such an intense feeling of boredom that the audience reached a kind of transcendence that can best be described as deja vu. Reveal after reveal is made as new characters are introduced and events unfold. They actually unfold. 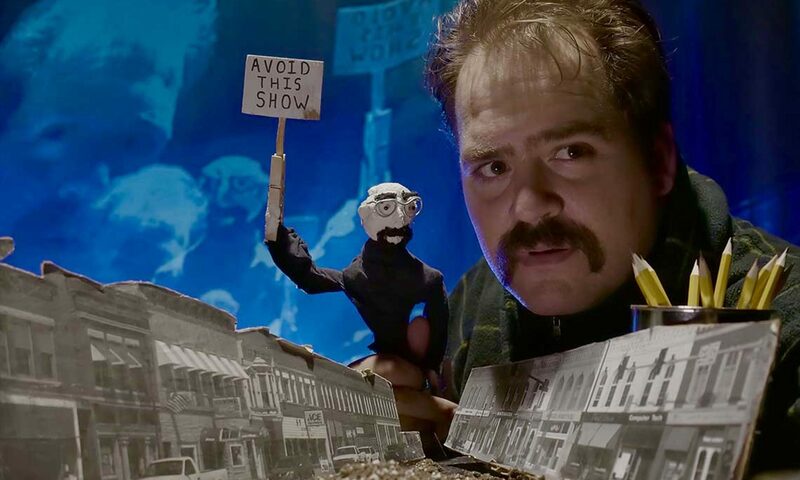 The puppetry that has connected Tedium with the Chicago International Puppet Theater Festival is hidden among the deceptively sparse set. When Dan Kerr-Hobert introduces a new development we get to make a discovery and understand the world a bit more. It reminds me of Willy Wonka and the Chocolate Factory when Gene Wilder picks a flower, drinks from it, and then bites into the candy flower-cup. Rather than colorful and candied, this world of pure imagination is a monochromatic sketching of artists and audiences toying with time. This world is the product of a dynamite design team. Sam Deutsch (puppet design) and Bernie McGovern (illustrations) create a three-dimensional world that reads like a graphic novel. This is further emphasized by Kate Hardiman’s specific and inventive lighting design that showcases the puppetry in unexpected ways. Tedium and Other Sensations makes the audience another piece of this colossal collaboration. In Dan Kerr-Hobert’s role as the lecturer, he says that “to understand what creates enthusiastic applause, what creates that bridge of light between the stage and those who watch the stage, would be to understand how love is made between two people.” All groups involved are trying to understand this impossible concept and invite the audience to contemplate it. It remains to be seen if we are worthy of the investigation.